Sworn testimony provided by former Quebec justice minister Marc Bellemare before the provincial commission of inquiry into Quebec’s system of nominating judges may be possibly be used against him in a $700,000 suit launched by Premier Jean Charest for “false, malicious and defamatory remarks.”After five days of vigorous cross-examination before the commission headed by former Supreme Court of Canada justice Michel Bastarache, Bellemare stood firm behind his testimony that Quebec Liberal Party fundraisers, with the consent of Premier Charest, had undue influence on the appointment of judges in the appointment of judges in the province. But in another surprising twist, Bellemare — who sought to dissolve the inquiry he described as a “costly and useless exercise only to abandon the lawsuit after he obtained assurances that his testimony would be broadcast — was granted last week the status of full participant, allowing his lawyer to cross-examine the 40 or so witnesses the commission has lined up to testify in the coming weeks, including Premier Charest. While the sworn testimony of witnesses such as Bellemare who testify during commissions of inquiry cannot be used against them in criminal proceedings, the same may not hold true for civil proceedings. Thanks to various evidence acts as well as sections 7, 11(d) and 13 of the Canadian Charter of Rights and Freedoms, s. 38 of the Québec Charter of Human Rights and Freedoms, and s. 11 of the Quebec Act respecting public inquiry commissions, public inquiry experts assert that while witnesses may be compelled to testify before commissions of inquiries, self-incriminating testimony cannot be directly used to incriminate the person in subsequent criminal proceedings. But there is a notable nuance. In Phillips v. Nova Scotia (Commission of Inquiry into the Westray Mine Tragedy),  2 S.C.R. 97, the Supreme Court of Canada held that prior testimony cannot be introduced a criminal trial, but evidence related to the subject of the inquiry testimony can be used if it would have been discovered in any event, points out a working group that published a model Public Inquiries Act on behalf of the Uniform Law Conference of Canada (ULCC). Established in 1918, the ULCC seeks to harmonize the laws of the province and territories of Canada and where appropriate the federal law as well. “Public inquiries are a tool for investigations and recommendations to policymakers,” observed Alastair Lucas, the dean of the Faculty of Law at the University of Calgary and the head of the ULCC working group on model Public Inquiries Act. “As an investigative body there has to be some limits as to how coercive public inquiries can be in dragging witnesses before them and forcing them to testify and produce documents to the inquiries,” added the co-author of A Handbook on The Conduct of Public Inquiries in Canada. Though it is also well established that the testimony provided by witnesses before commissions of inquiries cannot also be introduced as evidence during civil proceedings, there are exceptions, points out a Canadian lawyer specializing in public inquiries who spoke on condition of anonymity. 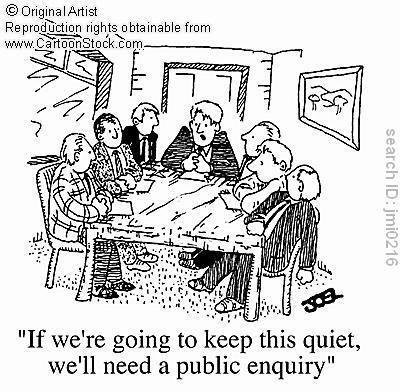 The same holds true for final reports penned by commissioners of inquiries. Even though commissioners may find fault or lay blame, their findings do not bind a judge presiding over a civil proceeding, added the lawyer. But there are exceptions such as when it is revealed that a witness provided contradictory testimony and there are telling and important differences between what they testified in a civil proceeding compared to what they said in a commission of inquiry. Another exception to the rule may be when a witness who testified before a commission of inquiry passes away in which case the judge presiding over the civil proceeding may hold that the testimony of the deceased may be introduced as evidence. And in Quebec alone, it is also possible that a judge may hold that a “clear admission of responsibility” made during a commission of inquiry may be introduced as evidence. Under s.2850 of the Civil Code of Quebec, an admission is the acknowledgment of a fact which may produce legal consequences against the person who makes it. “A clear admission of responsibility made before a commission of inquiry may be introduced in civil proceedings in Quebec because the Civil Code states that it is possible to introduce admissions as evidence,” said the lawyer. That’s exactly what Lussier did in the Canada (Procureur général) c. Brault 2006 QCCS 999. In interim rulings rendered by Quebec Superior Justice Gilles Hébert as case management judge in the sponsorship case, some admissions that were made during the Gomery Commission, formally the Commission of Inquiry into the Sponsorship Program and Advertising Activities, were allowed to stand. “I myself used what was said in the Gomery Commission against civil defendants and was vindicated by Justice Hébert,” said Lussier, adding that in his own opinion s. 13 of the Canadian Charter does not grant protection against self-incrimination in civil proceedings. Though on less solid ground because of the absence of precedence, Lussier also believes that witnesses who slander while providing testimony before a commission of inquiry cannot hide behind the shield of immunity. Another lawyer familiar with the inner workings of public inquiries notes that while the Canadian and Quebec Charter as well as the Quebec Act respecting public inquiry commissions provides protections against self-incrimination, it does not necessarily preclude the testimony provided by other witnesses during a commission of inquiry from being used against a person facing a civil trial. Originally published in The Lawyers Weekly.